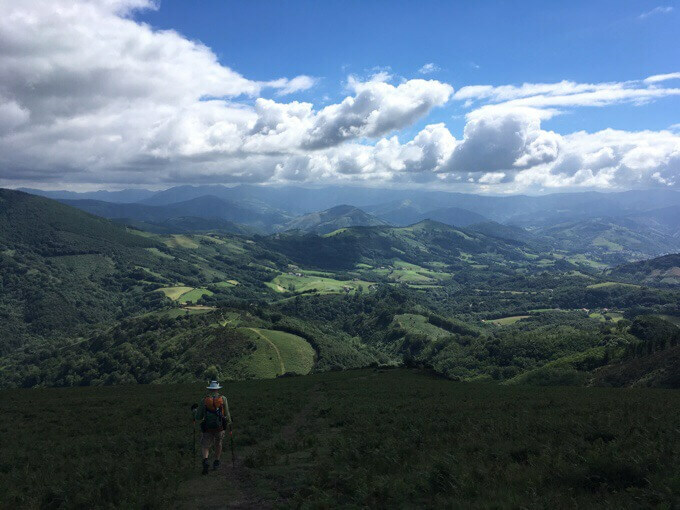 Yesterday, I took a 6hr train from Paris to Hendaye, the start of the Haute Route Pyrenees (HRP). 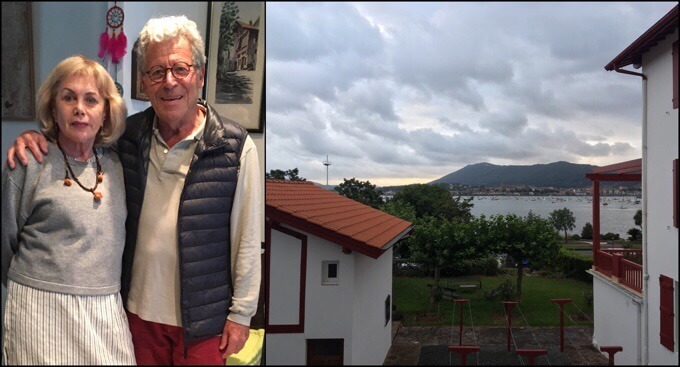 I initially planned to get a few hours into the HRP, but rain was expected in the evening, and it was pretty windy, so I spent some time walking around Hendaye with Why Not and Jim. 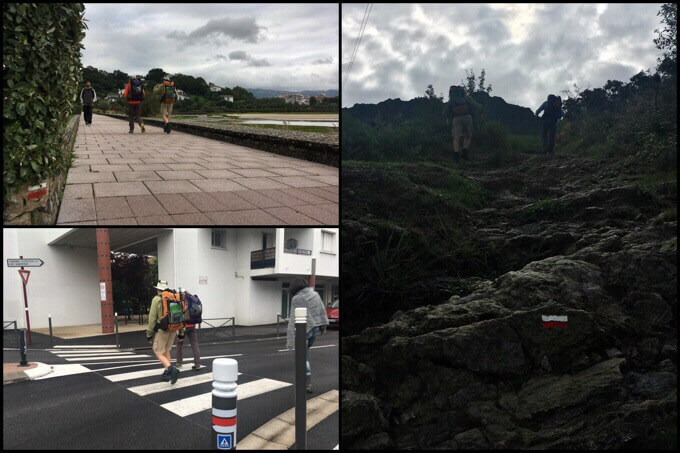 They arrived in Hendaye three days ago to start the HRP, but have been waiting out a great deal of rain and wind from a front that moved through. As I mentioned before, Why Not and I have know each other for years and hiked together last summer doing some high routes in the US. It’s a fun coincidence that we now get to start the HRP together. I also want to mention that last night, I stayed at Michel & Dani’s overnight who had been hosting Why Not and Jim the last couple of nights. 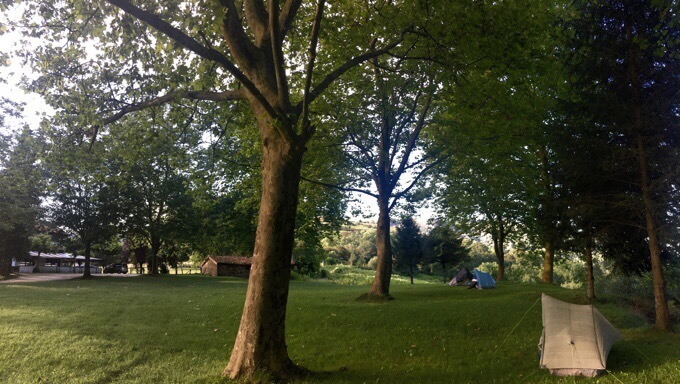 It’s tough to find affordable accommodation in Hendaye. They only speak mostly French and Spanish, but that is to be expected, and it was nice to practice my Spanish. I have almost no understanding of French. Here is Dani’s contact information if you’re interested. Tell them we sent you. Email: ipas.danielle ‘at’ orange.fr phone: +0330687516043. THANK YOU Michel and Dani! That brings us to today and the start of the HRP. We met up at 7am and took our time going down to the beach and going into the Atlantic Ocean. 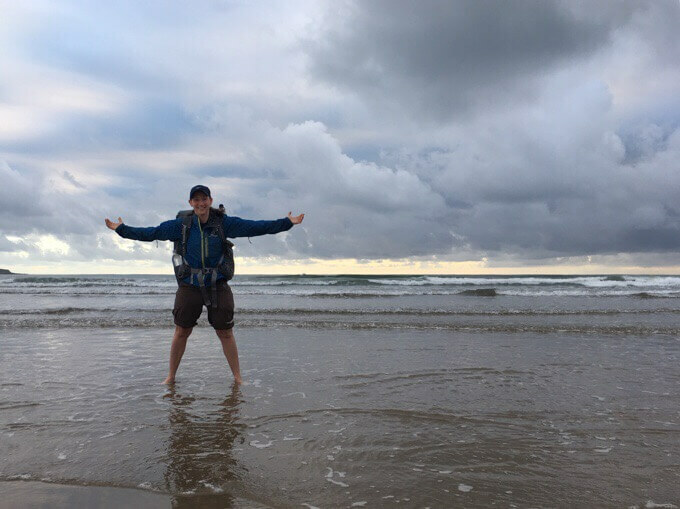 The HRP is about 500mi/40days traversing the Pyrenees on the border of France and Spain from the Atlantic Ocean in Hendaye to the Mediterranean in Banyuls-sur-Mer. I’m in the Atlantic with Why Not & Jim. Jim is holding a vial of ocean water to carry to the Mediterranean. 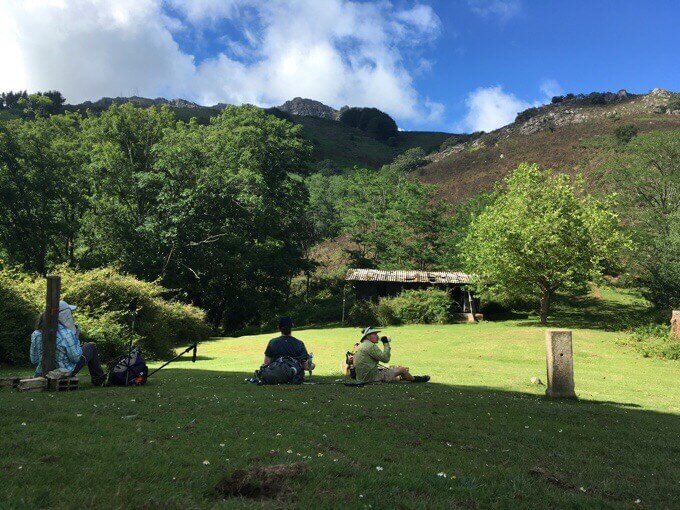 For the first half of the day today, our route followed the GR10, which is a popular trail in France that also goes all the way to the Mediterranean through the Pyrenees. There is also the GR11 on the Spain side that the HRP will overlap with tomorrow. 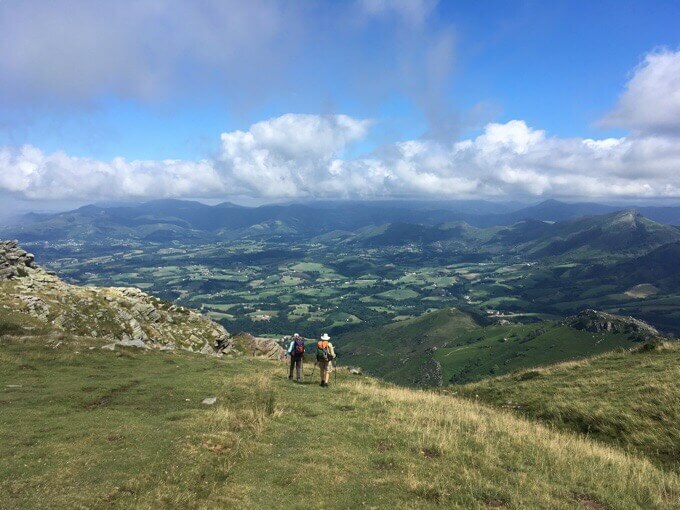 The HRP is the route between the GR10 & GR11 that tries to take the highest route along the Pyrenees sometimes overlapping the two more traveled paths. It was nice to start off on a formal route because it was signed with a red and white stripe. When there is a turn, the symbol takes the shape of a flag and hikers turn in the direction the flag waves. GR10 red and white blazes. We did this until reaching lunch at Col d’Ibardin. There was a ton of up and down today. If you’re looking for a flat stroll, this ain’t it. We had 4265ft/1300m of uphill and 3510ft/1070m of downhill, whew! 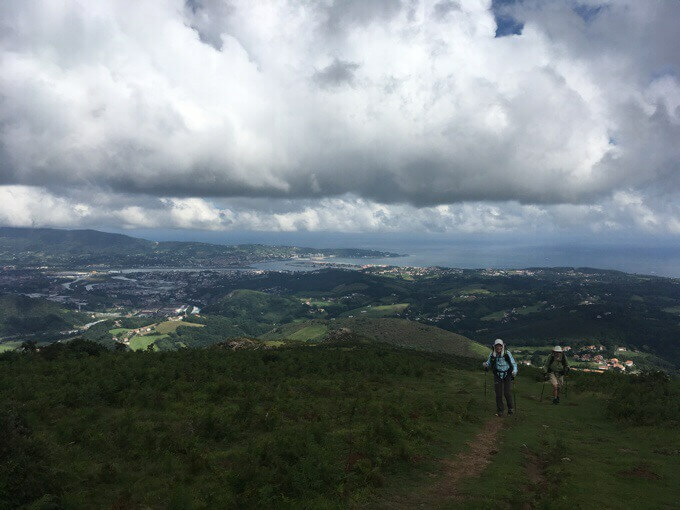 As we hiked up, we had great views all day overlooking Hendaye and the Atlantic Ocean. There were also a ton of horses grazing. We haven’t figured out why there are so many, but they are everywhere in all colors, and sizes. Some even have have long hair. The terrain was the full spectrum including sidewalk, paved roads, dirt roads, grassy, trail, rocky, steep, gradual, and flat. The guidebook does not indicate mileage, and only notes how long it takes to get from one landmark to another. This is sensical given that we are going to be on a route that has varying terrain and pacing. 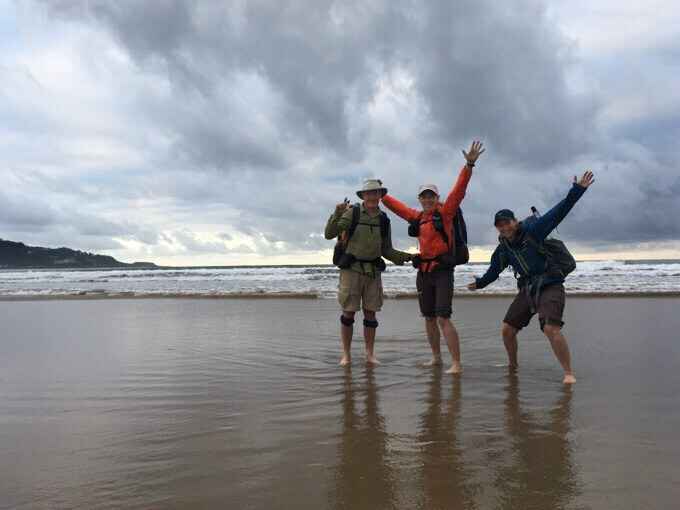 From what previous hikers have done, this first day is about 18 miles. I thought about tracking this to have mileage, but then I decided to embrace it and it is actually quite nice to have a less concrete label to what I’m doing and just have a nice time estimate. The author, Tom Joosten, has given times that are quite good estimates for the type of hiker that would be looking to do a high route. Our times today were only just slightly faster if not right on the estimated times. It was Sunday, so all sorts of people were out. There are tons of paths and routes out here, so we saw people, but no one else doing what we were. There were, tour groups, mountain bikers, families, trail runners, and even dirt bike riders. Even with all those people out, it still felt very spacious and peaceful. 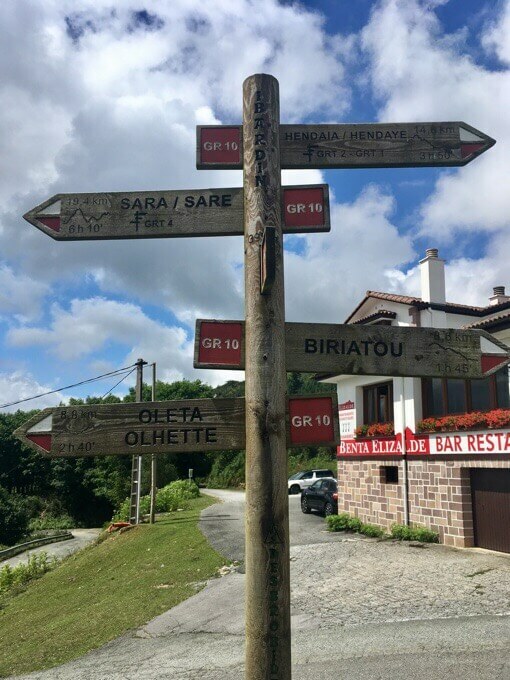 We did overlap with one GR10er, a woman that started when we did from Hendaye. 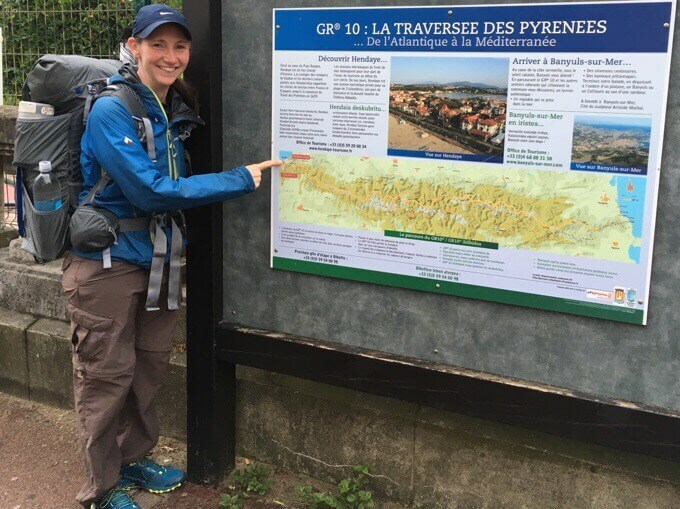 Our paths overlapped until lunch and we won’t be on the GR10 again for quite awhile. Cool trail signage that even includes distances and elevation profiles. Lunch was at Col d’Ibardin. Most grocery stores are closed on Sundays, but this area is supposedly super popular and open 7 days a week because it’s in Spain and not taxed or something. I didn’t expect it to be so modern. There were a ton of options. 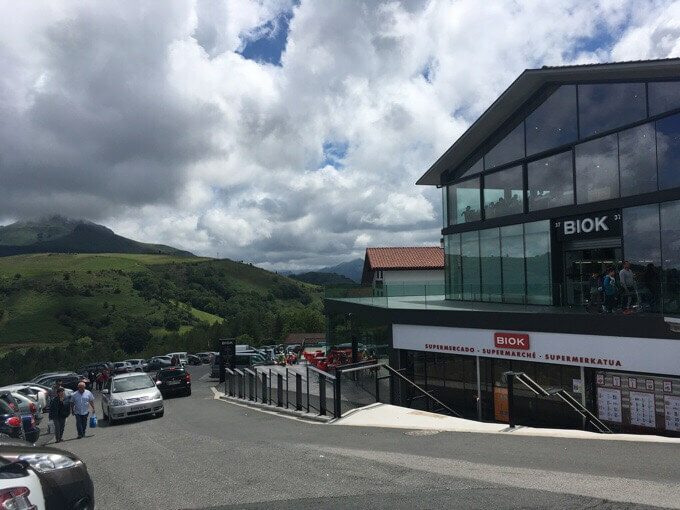 One note for future hikers, the BIOK supermarket is a minute further down the hill than the small one that you approach first. We mistakenly shopped and had lunch at the first one. It has many more choices and cheaper prices than the first one you see. Lunch at BIOK, but the one just 1min further down the road had a bigger collection and was cheaper. The second half of the day was bliss! 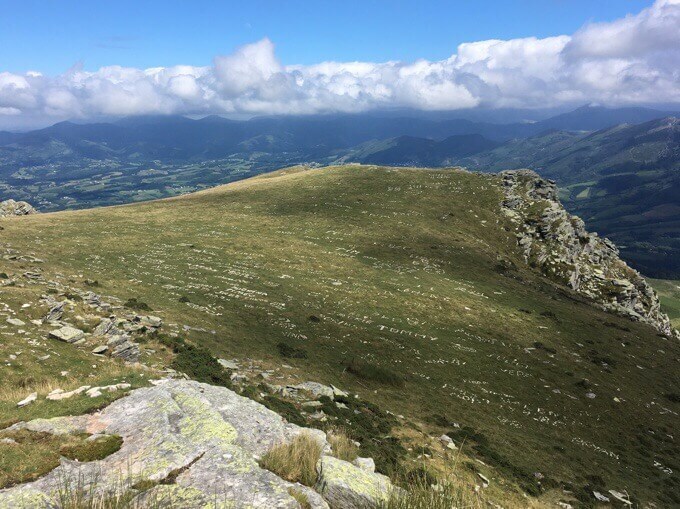 The route skirts the summit of La Rhune where we saw an old trolley train bringing people to the the top. 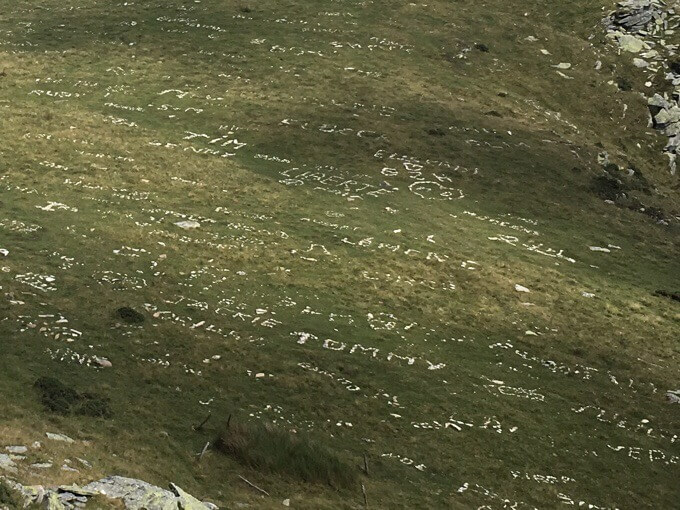 On the south side of the climb, we came to a view where there was a full view of various words and names spelled out in rocks in the grass. It was pretty cool. Then we began the descent to Col de Lizuniaga, and the views were spectacular! We loved the grass up top too! Then came the steep and rocky part of the descent. My legs were jello and we all were feeling the day’s exertion, whew. We took a break at the bottom of the descent and looked back on how far we came. La Rhune summit is the far summit in the center. We went just a bit further to a restaurant noted in the guidebook that allows people to camp in their lawn. The owners only speak Spanish, so my basic Spanish was very helpful. Even though the restaurant was closed, they let us use the bathroom. I had heard that between Spanish and French, knowing Spanish is much more of an asset along the HRP. So far, that’s been true. It seems most French speakers know English at least a bit, but most of the Spanish speakers don’t. It is a pretty cool feeling to be able to communicate. Temps have dropped a bit and it’s perfect weather for sleeping. The HRP made quite the first impression, I’ll say that! … and, we’re off!! Hope you found your “alcool a bruler” (for the stove!) OK, Erin? 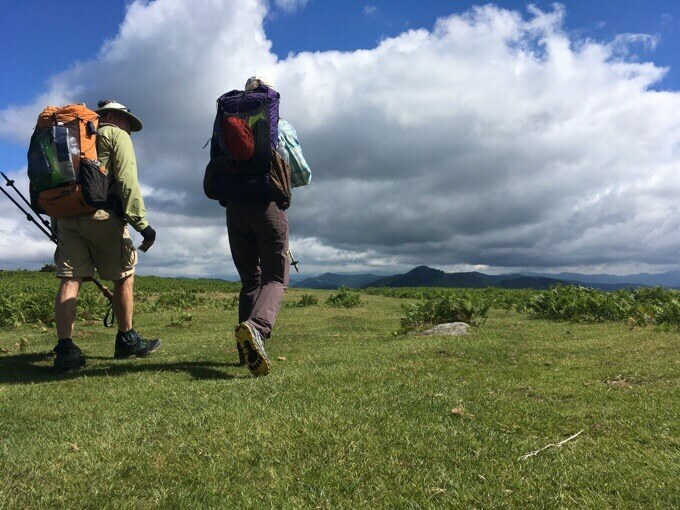 Wow – I must say that your first day on the trail yielded some beautiful pictures and sounds like it was a great varied terrain day also. Glad to be “back on the trail” with you. 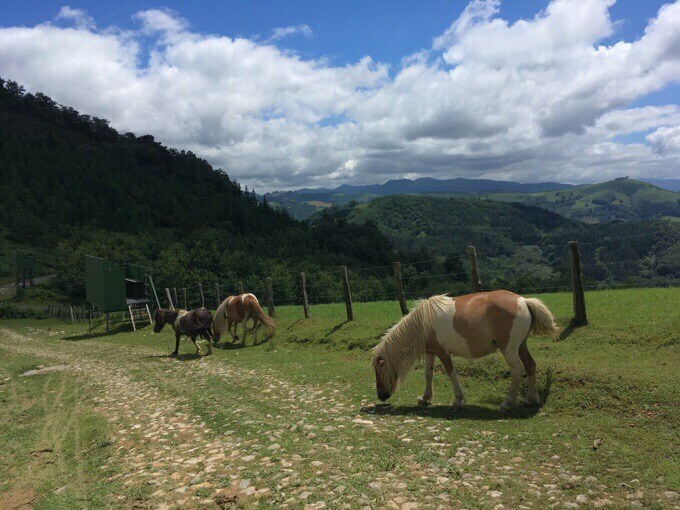 I told you the pyrenees are amazing and this is just the beginning! you will love this trail! We have all the GR books and can’t wait to get out there. …. 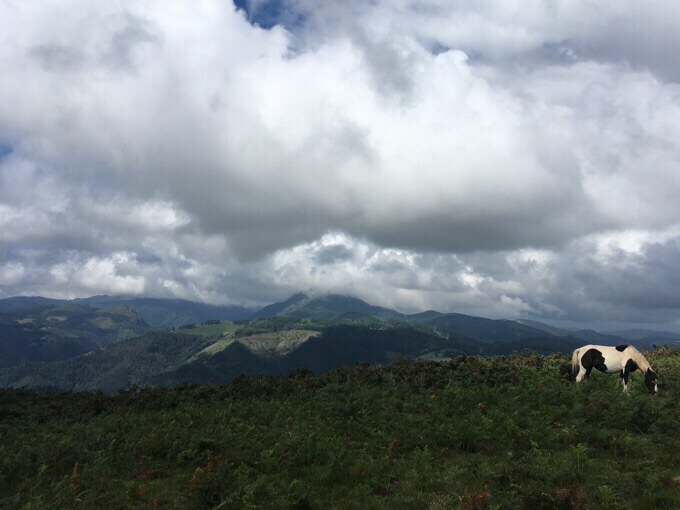 I’ve spent a lot of time in Europe – including Banyuls! Our last trip was very much off the beaten track and it’s inspired up to see more of Europe through a different lens. Actually …. just realizing for me it’s been a dream for about 20 years now, ever since I first learned about the walks and hikes. 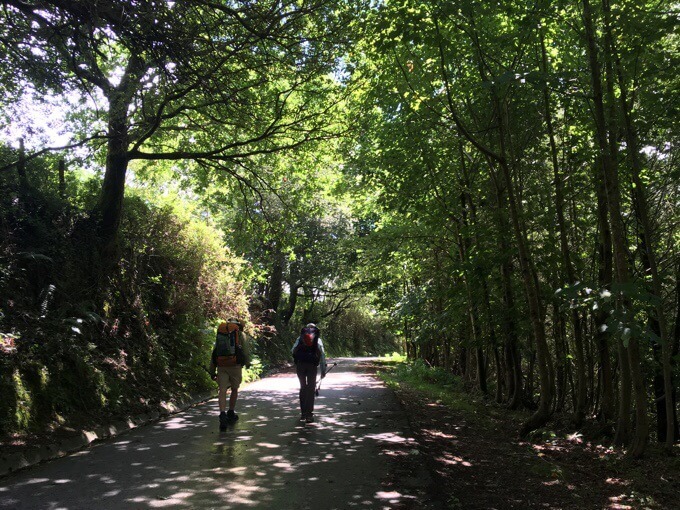 A friend and her mum were doing some thru hiking In Spain. Do buy Ton Joosten’s book about the HRP. So much more the true Pyrenees, than the GR10 is. What a great start! Why Not said her legs were jelly too!! That is a lot of climbing/descending for Day 1! Blessings………. Hola! 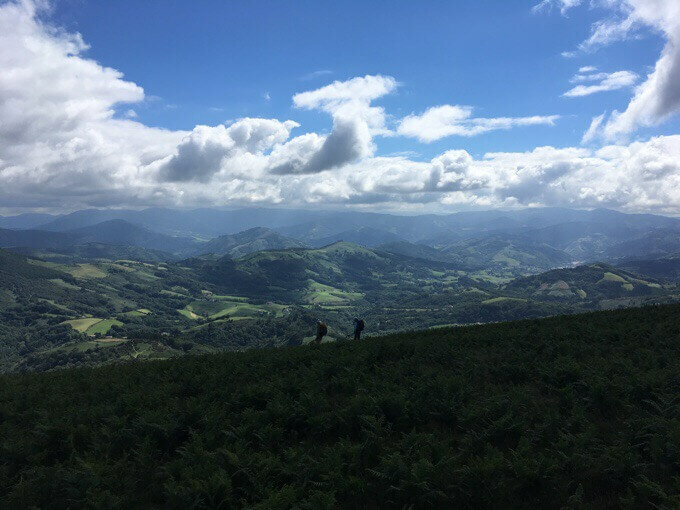 Just spectacular views to start your trek! I love all the hands and the horses, but I will imagine that these aren’t to be eaten. Once again, your commenters, and Nancy’s, really add to my enjoyment of your blogs. Ugh.. The autocorrect on this tablet is loony. Not hands, but names.. the rock names in the grass.